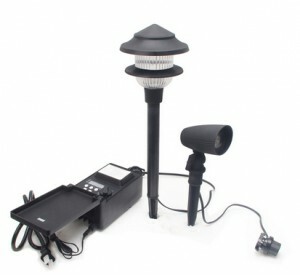 When looking for low voltage outdoor pathway lights, the tiered top is the most common. In this article we will look at several individual lights and two sets of lights. You can read and determine what will work best for you. 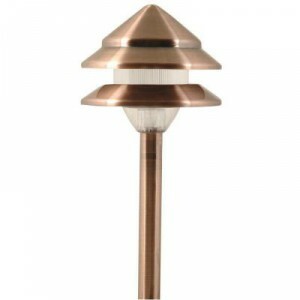 The single light fixture in the Marion style is made of stamped aluminum and has a copper finish. The ribbed plastic lens will defuse the light in a 360 degree range. It will draw 7 watts of power from your wire run. It includes a premium connector that will fit both 14-2 and 16-2 lead wires. The spike connects by screwing it together, not just a slip joint. This kit will include 6 metal light fixtures(4 post type and 2 spot type), 75 feet of wire and 45 watt transformer. The bulbs are LED with the post type having an output of 100 lumens (1 watt) and the spots 250 lumens # watts). The transformer has a clock timer and dusk to dawn feature to control when the lights are on. It has a digital display for the clock functions. This is a set of ten black plastic lights, 50 feet of 18 gauge cable and a 48 watt transformer. No programming as the transformer is controlled by a dusk to dawn photo cell. Each light will have a 4 watt bulb. With no on and off switch, put some tape over the photo cell to check the connections when installing lights to the cable. The newer twist and lock connectors will be easy to install. The Holton style of light will include one light fixture made of cast aluminum with a nickle finish. It will have one 11 watt low voltage bulb. The plastic lens will have ribs to defuse the light 360 degrees. A premium connector is included to connect to your wire run. Just add to an existing run or get several and make a new run of lights for your outdoor space. 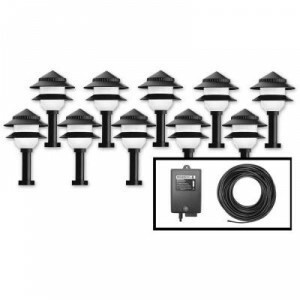 Buy several and just add a transformer and wire run to illuminate your outdoor space. This three tiered light fixture is plastic with a black finish. It has a 1 watt LED bulb that should never need replacement with a white plastic lens. They are brighter than a 4 watt regular bulb. This type of fixture with the LED bulb are a great replacement for old low voltage fixtures. They are sealed to keep out moisture/insects and the bulbs will never need to be replaces. 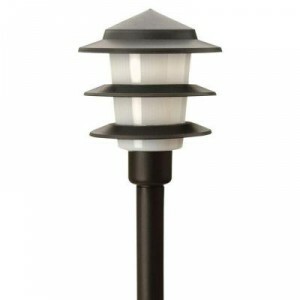 The Pagoda style of post light is made of die cast metal with a painted black finish. The 11 watt bulb will work with any existing low voltage system. Post screws to light fixture for a good fit. Connector is a block type that will need a screwdriver to install to your wire lead. When looking to install low voltage lights in your outdoor space it will take a little planning. To help you I have written several post to help you. First I would start with the planning the layout, then find out what is all needed when you do not purchase a complete kit. If you do not purchase a complete kit you will need wire, transformer and proper wire nuts. I have a post to pick out the proper product for your outdoor space. Very little will be needed in the care of your lights. If you have the LED light, the bulb should last eh life time of the fixture, as they are not made to be replaced. Regular low voltage bulbs can be replaced by taking the top off of the fixture and just pulling it out and replacing it. If the bulb still does not work check your wire connections for a loose wire or underground pest damage. Some low voltage bulbs can be replaced with a LED replacement bulb for low voltage fixtures. These bulbs are still quite expensive. 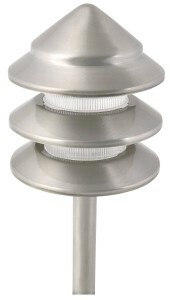 You can purchase a kit or individual lights for your low voltage outdoor pathway lights needs. The kits in this post are made to work as one unit, they cannot be added to without changing the transformer. My personal opinion is to plan your layout and buy the items one at a time that will match your needs. If you only have a small area to illuminate the kits will work out fine. As always if you have questions or comments about this post use the form below. Very nice Ideas for building projects, and you give access to nice Products to use in our building projects. Great Job! Every post on this site will be about some ideas for your outdoor space. Nice to here form you. Glasd dyou like these lights. See my other post to see what kinds of lights will work for your.